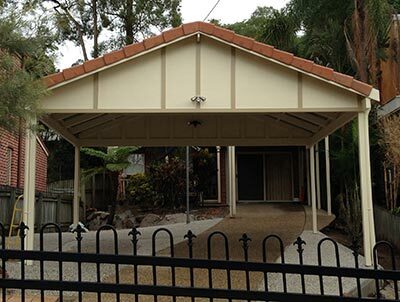 Most of the projects that Outside Concepts approaches have specific challenges and it was no different when homeowners from the Brisbane suburb of Indooroopilly employed Martyn Hewett from Outside Concepts Kenmore Branch to design and build a double carport. With the carport required on a small block with little space, one of the first challenges facing Martyn was that the carport had to be built over sewer and stormwater drains. Footings for the carport’s posts needed to be 1.9 metres deep and therefore accurate positioning of the carport in relation to the sewer and stormwater drains was vital. The second challenge facing the homeowners and Martyn was the choice of material for the roof. A tile roof to match the house would have been ideal but didn’t fit the budget. Ingenuity was required and a smart compromise was reached. The solution was to use Colorbond roofing with barge tiles that matched the house attached to the front of the carport. With the fitting of security lights, the homeowners now have a beautiful and practical double carport that looks like it has a tile roof!